In the last days of July, in an Iniva-devised a public programme, curator Adelaide Bannerman facilitated two-parts of a three-part workshop series titled History Lessons: Burning Illusions. Aligned with the South London Gallery’s exhibition of The Place is Here, these sessions centered the ways we as an audience engaged with the construction of historical narratives. As my second visit to the SLG’s presentation of The Place is Here, it felt like an opportunity to commune with the works on a more intimate level. Falling into the depth of archival material as well as engaging with films in their full length, this workshop enticed me to give the exhibition all the time that it insisted upon. During the first session of the workshop, a group of about ten participants spent a few hours in the gallery equipped with the privilege of time, patience, and the coolness of a cloudy day. After about two hours, we reconvened in the gallery’s Clore Studio. In the latter half of this workshop, experiences, observations, and questions incited by the works and archival material were recollected as we sat closely in a circle. Within this ring of people lay a mixture of generational and cultural experiences that inflected our varied and valid relationships to The Place Is Here. In many ways, this circle that we found ourselves in, in full view of one another, reminded me of time in the cyclical sense. Coming back around the bend were questions of belonging, inquiries as to what has changed between then and now, and what can be gleaned from the efforts of these artistic foremothers and fathers. As people began to share their relationship to the films, text, and visual material, I was reminded that maybe time continues to incite from us similar questions so that we may continue to complicate generational narratives of success. These are questions of identities, lost, stolen, maintained, created, or relinquished – questions of belonging, colluding, and disassociating. Perhaps the past inflames the contemporary to fantasize a future better, clearer, and fairer than that which is being lived in a language not yet perfected, but in constant development. Stuart Hall’s 2004 text, Black Diaspora Artists in Britain: Three ‘Moments’ in Post-war History served as a guiding light as participants began to navigate what Hall had laid out as the moments that preceded and followed the 1980’s Black Arts Movement. Loosely linking our experiences of the exhibition to Stuart Hall’s “genealogy” of black artistic attitudes, History Lessons: Burning Illusions provided a communal space for discourse anchored in dialogue and lived experience. The personal and professional interjections helped me to construe the exhibition as a point of entry rather than a point of finality. The period that The Place is Here articulates became increasingly unfixed and informed by its resistance to complete cohesion. As other workshop goers divulged their ways of personally entering this exhibition, I began to let go of the notion that these narratives were somehow limited to this space and this time. The stories of those members who relayed the migrant experiences of their mothers and grandmothers echoed the narrative laid out in Martina Attille and Sankofa Film and Video Collective’s Dreaming Rivers (1988). It was a privilege to be audience to the personal narratives that in their own way inform how I, as well as others, perceive the complexities of what it meant to be a creative of color during the 1980’s, as well as the era that preceded it. For the second workshop, some new and familiar faces gathered in the Stuart Hall Library. What would ensue would prove that our first session was only the beginning of chipping away at the iceberg that is the ‘Black Arts Movement.’ This second session brought to the fore publications that helped to complicate and add depth to the work and printed material encountered at the South London Gallery. As a team of researchers we traced the nuances of this artistic movement, uncovered new and timeworn attitudes around race and its relation to the art world. Circulating through the space, each of us began to zero-in on those moments which enticed or confounded us. Contemporary journal articles, namely, The Complexities of Exile, Self-Marginalization, Exclusion, and Inclusion: A dialogue between Carlos Caplan and Gavin Jantjes (2017) engaged in a dialogue, unbound to time and location, with the Organisation for Black Arts Advancement and Leisure Activities (OBAALA) debut exhibition catalogue Hearts in Exile (1983) shown at the Black-Art Gallery. Traversing the boundaries of time and space via the rich resource that is the Stuart Hall Library, I remembered the text written in marker on the cardboard figure constructed by Lubaina Himid. In part, it read “The time is now and the place is here, and there, and here, and there.” And that’s when a lot of what we had been doing over these two workshops fell into clarity. Rediscovering parts of this history, and deconstructing the space between then and now reinforced the idea that the efforts of the artists of this period are still visible in this moment. While our language, attitudes, and relationship to race simultaneously evolve and devolve, we must not forget that wherever we may be, physically or temporally the place and time for change is here and the boundaries that separate us are illusory. The History Lessons: Burning Illusions workshop series culminated on September 2, 2017 with discussions led by the Patchwork Archivists, GLC Story, and Adelaide Bannerman. This session also closed with a screening of Burning an Illusion (1981) directed by Menelik Shabazz. For direct access to the materials collated during the second session please follow or link to a list of texts available at the Stuart Hall Library. 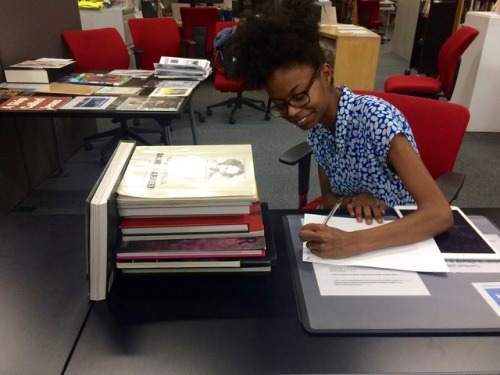 Alani Nelson is a daughter, sister, as well as a volunteer at the Stuart Hall Library. She has a BA in Art History and is currently working toward a masters in Curating at Goldsmiths University. She is more often than not thinking about techno-rituals with a focus on those digital engagements that underpin her diasporic experience.